Whenever you need to exercise your creativity or focus on reading or professional activities at home, using the sofa as an office and the television as background noise may be a terrible idea. 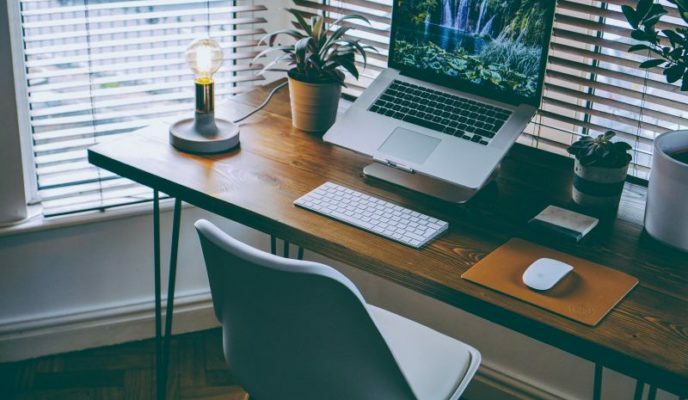 On the other hand, people who use their apartments as home offices may get the constant feeling of being constantly working, even though they are at their resting place. Setting aside a space in one’s home and turning it into an exclusive spot for studying or into a private office may be a way of increasing productivity and ensuring that professional and personal activities never get mixed, and that the study or work get the proper attention. According to architect Natasha Haddad, of the MN Interiores office, the first step is assessing what exactly are the needs of the individual, which activities will be performed and what equipment will be needed for that. “Assessing if computers will be needed, or some special furniture, understanding the space such equipment will occupy, what is the amount of papers and books which will have to be stored. Along with the furniture, the organization must also be planned,” she details. In the apartment she designed along with fellow architect Mayara Clá, a 40-square-meter studio, a young businessman works often from home, but doesn’t have a specific room for that. “We had to optimize, because his need was having an office corner in a small apartment. In such cases, you must envisage different uses for the same environment. The office is next to the living room, so it necessary to mix them without making it too heavy, without taking away the coziness from the area where the sofa is,” says the architect. Therefore, the solution they found was dedicating a corner of the living room specifically for that, so the businessman wouldn’t be forced to work sitting down on the sofa. The workbench was installed next to the bookstand, taking advantage of the natural light which comes from the windows. According to her, using design furniture is a way of making better use of a room, which may occasionally be too small. “It is an intelligent option, that enables a lesser loss of space. Areas such as wide corridors and verandas are being increasingly adapted to be used as home offices,” she points out. After assessing the needs demanded by the activity, architect and interior designer Larissa Loh suggests to resident detecting the best location in the residence, considering aspects such as lighting and ventilation. “First of all, spaces that have natural light must be privileged, but one must also consider well the use of lamps. A table lampshade or a light source that prevents shading,” she suggests. Besides, the circulation around the house should also be taken into consideration. “When it comes to studying, a separate room is more interesting due to the need for silence, because it is usually less used than a living room,” she says. When it comes to decorating, no excessive colors nor extremely eye-catching wallpapers. “Using plants in the décor makes the moment in that room more pleasant, wood makes it cozier and warm, and boards with encouraging sentences may be used,” says Larissa. She also adds that in order to turn that space into something special, those who wish to use more lively colors should paint a wall, or part of it, with different colors. “Choose neutral colors, that are not stressing on the eye, like grey, wood colors, black, colors that are not that lively. I wouldn’t recommend using patterns, since these places are not usually very ample. So the ideal would be to use paint and a textured wallpaper, not a patterned one,” completes Natasha.